My husband is a wonderful shiny gemstone. He came with me, he spoke for me while I sat there like a zombie, and he got it sorted out. He was firm, he let the GP know we were disappointed with the care I had received, and he asked for specific things that I needed. The GP was actually quite sympathetic and apologetic. She gave me the prescription for metoclopramide (which she said she had never prescribed before for pregnancy and had to look up in a book), she gave me an obstetric referral (though she said she didn’t know how long it would be until I heard from them) and she assessed my mental health using a self-completion questionnaire. 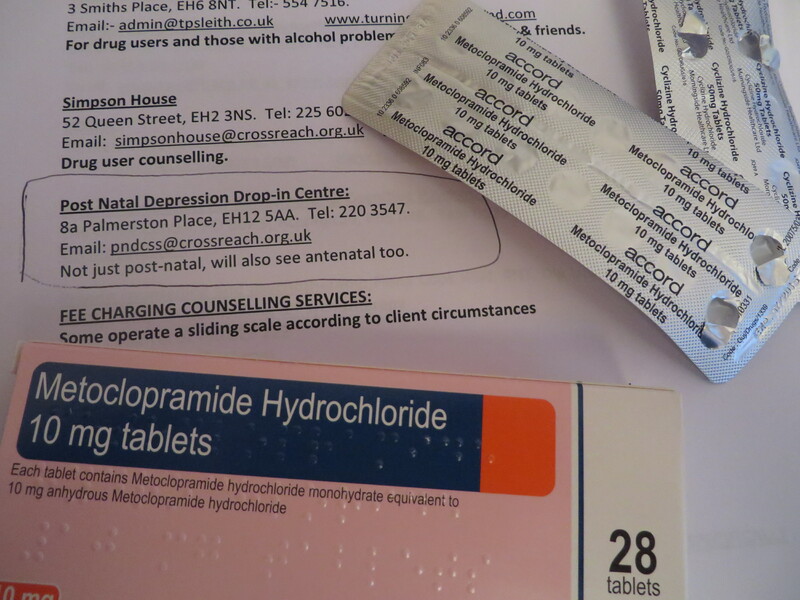 She then asked me if I would consider anti-depressants (I gave a very incoherent answer about how I didn’t want my mood artificially altered) then provided a list of counselling services suitable for antenatal depression. Whilst I picked up my prescription, the husband phoned the counselling service and got me an appointment for tomorrow. So, that feels like progress. It is rubbish that we wouldn’t have been able to get any of this if my friend the obstetrician hadn’t told me exactly what to ask for. Me asking several medical professionals for help should have been enough. I don’t think it should be my responsibility to lead on navigating my way through the NHS and their systems and drug protocols. I’m not even a lay person, I often work with the NHS, and I had no idea where to go and what to ask for. That’s not my job as a patient. And when you keep getting knocked back and treated like a time waster that doesn’t help either. Which leads me to my second ‘it is rubbish’. It is rubbish that I had to get my husband to take time off work and do this for me. That the whole experience has ground me down so much that I no longer have the confidence to do this for myself. This isn’t me, and I find it humiliating. But he’s a shiny star. This isn’t easy for him, in fact it is quite a burden to have to look after me and cook for me and worry about me and supervise me any time I need to go anywhere. It must be very dull having a no-fun wife for so long, and losing his primary support network as I am incapacitated. He should be able to enjoy expecting a baby, and this is spoiling it for him as well as me. I’m immensely grateful to him. I’m glad you’re finally getting better care. You’re right that it shouldn’t be that hard. What about all the other women who don’t have OB friends to tell them what to ask for? Hang in there, and good for you and hubby for sticking up for yourselves! He sounds like a great guy. Hope you start feeling better very, very soon!